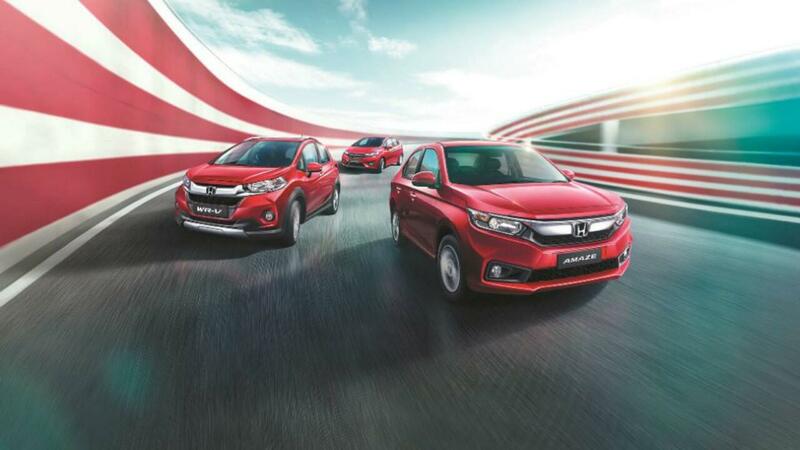 Honda Cars India (HIL) has launched exclusive editions of the Amaze, Jazz and WR-V with added features. These editions will be based on the already existing top-end versions of the respective cars and will cost higher than them. These exclusive editions will be available in Radiant Red Metallic and Orchid White Pearl across the three models. They will come equipped with additional exterior features along with interior features. The Amaze will get alloy wheels with dual tone black stickers. There is also a front armrest made available with slide function. Also added to the feature list is a console box for ease of access. The WR-V receives an all-new black painted tailgate spoiler with LEDs as well as special body graphics. The Jazz too receives an all-new black tailgate spoiler with LEDs and special body graphics. It also gets a sporty black-painted alloy wheels. The exclusive edition of the Amaze will be priced at Rs 12,000 above the VX grade and will cost Rs 7,86,900 for the petrol version and Rs 8,96,900 for the diesel version (ex-showroom, Delhi). For the WR-V, the pricing will be Rs 18,000 over the VX grade and will cost Rs 9,34,900 and Rs 10,47,900 for the petrol and diesel variant respectively (ex-showroom, Delhi). The exclusive version of the Jazz will cost Rs 19,000 over the VX CVT Petrol at Rs 9,22,900 (ex-showroom, Delhi).